Thanks for taking the time to post pictures. I know I need to upgrade the lights on my Ranger, I'm sure I don't know what I am missing. Would love to install the 30" light bar from Rigid. Really nice upgrades. I am going to look into those red led's for my trucks. I already have them set up to turn the dome light off from a switch. Being able to see with out a flashlight will come in handy. Great pics and info. I added leds as well to my gator. What a difference! This has nothing to do with predator hunting but I have loved my LED lights and I think I've added a light bar in the center since starting this thread. 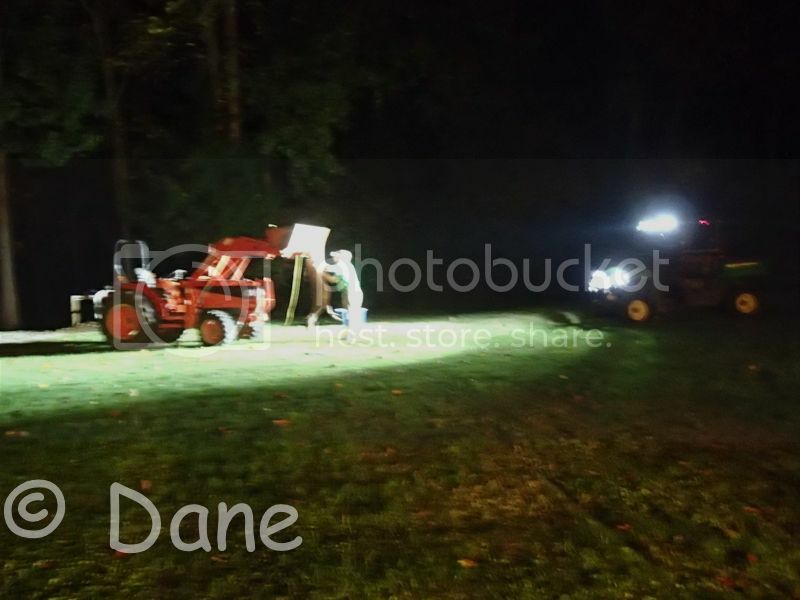 Last night I was able to work out in the yard with my Gator providing work lighting to dress deer. The flood light bar in the center and flood Dually's on each side provide strong, even illumination and the multiple light sources minimize shadows when working. If only I could teach my wife to hold still to take a decent night photo. Congratulations on the deer. Those lights sure do the job alright. The prices on LEDs have come down a lot recently. Recently got a curved 40" bar for less than what I paid for a 20" bar a year ago. Both are the Chinese ones off of ebay and I use them almost every weekend, been great. Cows cant jump out in front of me like they used to, and I can spot all the pot holes and rocks sticking up in the dark better than in daylight. People know Im coming around the corner before I get there too have had comments to the effect that they were suspicious if maybe a UFO was landing. Its really nice to have so much light all over the truck (including underneath) and not have to run heavy cables and massive fuse blocks for halogen or HID lights and extra batteries. Lots of different sizes and mounting options out there now. Last edited by Velvet Jones; 10-24-2014 at 02:03 PM. Nice!!!! Im an LED freak. I love led lights. Spent about 600 to replace all my light in my house with LED. Did the 5k bright white. Really makes a difference. Going to add a LED light bar to the top of my truck soon.